NECKLACE - SARAH COVENTRY. 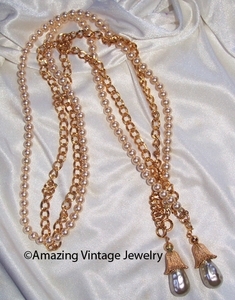 "FASHION PARADE" LARIAT FROM 1964. AS IT WAS ORIGINALLY SOLD, WITH ONE STRAND OF TEXTURED GOLDTONE LINKS AND ANOTHER STRAND OF FAUX PEARLS. THIS VERY VERSATILE NECKLACE CAN BE WORN SEVERAL WAYS - AS A 2-STRAND NECKLACE AS SHOWN, WITH THE GOLDTONE CHAIN AND FAUX PEARL CHARMS, OR WITH THE FAUX PEARL STRAND AND FAUX PEARL CHARMS. ALSO, THE FAUX PEARL CHARMS ARE DETACHABLE SO EACH OF THE NECKLACE STRANDS CAN BE WORN WITHOUT THEM - EITHER AS A GOLDTONE CHAIN, FAUX PEARL STRAND, OR TOGETHER AS A 2-STRAND NECKLACE. tHE STRANDS CAN BE TIED LIKE A LARIAT OR SAUTOIR, OR USE THE CLASPS TO HOOK THEM TOGETHER. GOLDTONE STRAND IS ABOUT 29", FAUX PEARL STRAND IS ABOUT 29 1/2" LONG. FAUX PEARL CHARMS ARE 2" LONG INCLUDING THE CLASP. EXCELLENT CONDITION IN THE ORIGINAL BOX ON THE ORIGINAL CARD.